Recommended by NVC trainers, Terri Harmon. Pam Whitman writes: I read parts of this book as a reference for my Nonviolent Communication class and was struck by the power and clarity of the ideas presented. It is revolutionary in its approach, questioning many of the basic assumptions about how things are done in our culture, from the raising of children to how we run our schools or treat our employees. Many of the ideas amplify aspects also addressed through NVC, e.g., doing away with a hierarchical structure that perpetuates power struggles and undermines human dignity through the use of rewards and punishments. 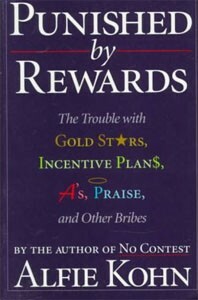 This book is not just a treatise of beliefs but a well-researched, thoroughly documented and well-written work that shows that rewards (and punishments) are at best only effective in the short term and are actually counterproductive in the long term! It exposes the behaviorist model on which so many of these assumptions are based. External rewards can supplant our intrinsic motivation for acting and relegate the human being to the status of a programmable automaton. I had been curious about this book since it was first published. When I finally read sections of it, the ideas were so pertinent and compelling, I could hardly put it down. I was heartened by the Afterword, which supported the validity of the book’s premises, added after the author had had a child of his own.